This envelope is preassigned to your account number. Upon receiving new envelopes please verify your address. Do not share envelopes with other accounts or locations. 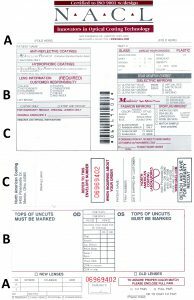 Section A: Print patient’s name and/or tray number on the lines provided. Section B: Place an “X” in the box pr circle the type and color of the coating desired. Section C: Identify the lens material and use the SPECIAL REMARKS AND INSTRUCTION BOX for any additional information or request. Please note that North American Coating Laboratories will not be responsible for breakages which result from not properly identifying the lens. Section A: Fill in the Rx information to assist us in providing you the best coating. Mark multifocals in the space provided. This will help us to keep the correct lenses with correct envelope. Section B: Place the lenses on the back of the envelope as shown in Fig. 2. Use a #2 pencil to draw the outline of both lenses. Please hold pencil straight up and down for the most accurate tracing. Section C: Detach the top part (Fig. 2) of the back of the envelope which has the CONTROL NUMBER located on it. Use this number to call and track the job during processing and for your records.